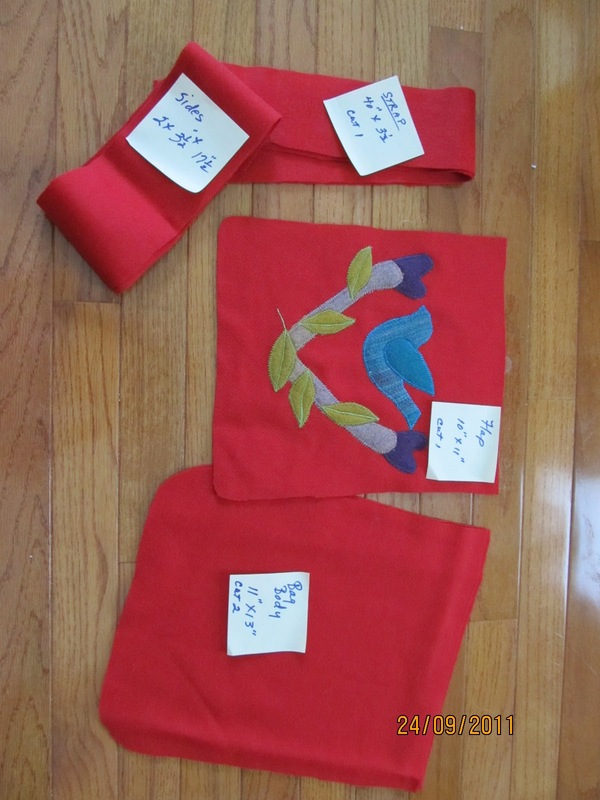 This happens to be my choice of size but you can make any size you want.I put the measurements I use on the little notes. This is a lovely red wool and I thought I would do some applique on the flap. I will embellish it a bit more when I get it to-gether. The lining is cut out the same way and I use a lightweight Pelletex that I get from Joggles to give it a nice sturdy quality. The Messenger Bag has so many possibilities. With the flap you can do so many things. Crazy pieceing would be nice too... Maybe I will try that. I really want to have a go at one of these. The pellex(Pellon) is a firm non woven fabric, Sometimes fusible and sometimes not...comes in different weights. What it amounts to is use an interfacing that gives some stability to the fabric and holds it's shape.